A few weeks ago our neighbor and friend became an American citizen. He’s English but married to an American, and so we threw a party involving gun magazines, fanny packs, and all kinds of tacky-as-hell American flag nonsense. It was kind of amazing, and of course American food was on the menu. Cheez-Its were practically the main course. Now, I don’t know if slaw is necessarily American originally, but it sure as heck feels like a native food at this point. Plus, it’s easy to make and can be a healthy side dish alternative for this time of year when grilling out is starting to happen a lot. On this particular night we ended up with about 5 starchy side dishes (ain’t nothing wrong with that), so this was a nice light addition to the mix. 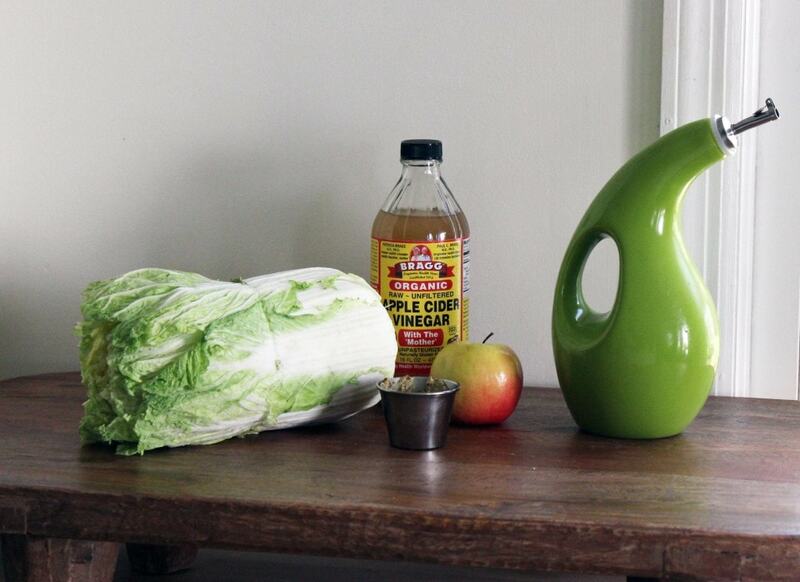 Plus – the apple + grainy mustard is a combination I have a feeling I’m going to be using a LOT this year. It was really delicious and there were zero leftovers of this dish, which I think speaks volumes about slaw, which is sometimes more of an afterthought. 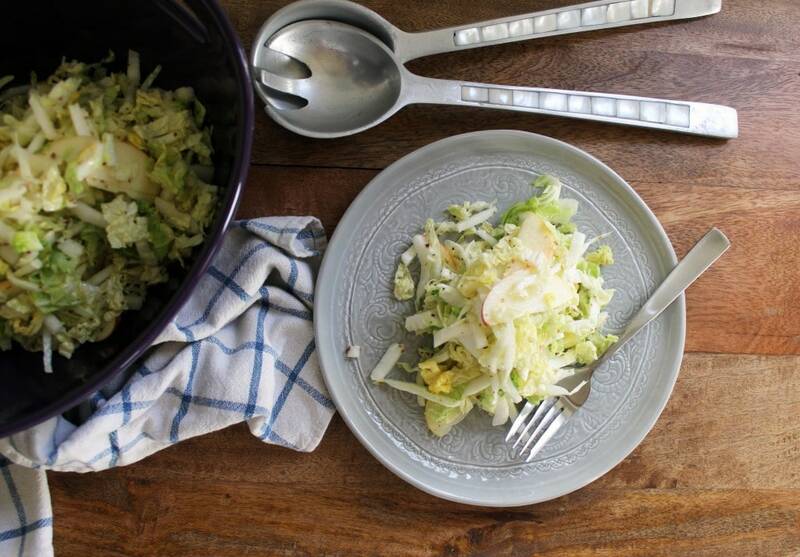 You need cabbage (savoy is nice an sweet here), an apple, grainy mustard, apple cider vinegar, and olive oil. You might need a pinch of salt, but that’s really it. 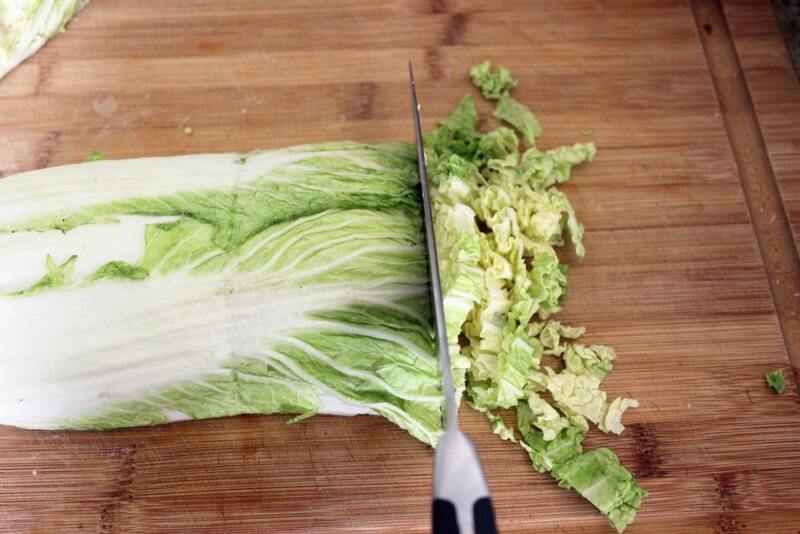 First, we’ll make the dressing. 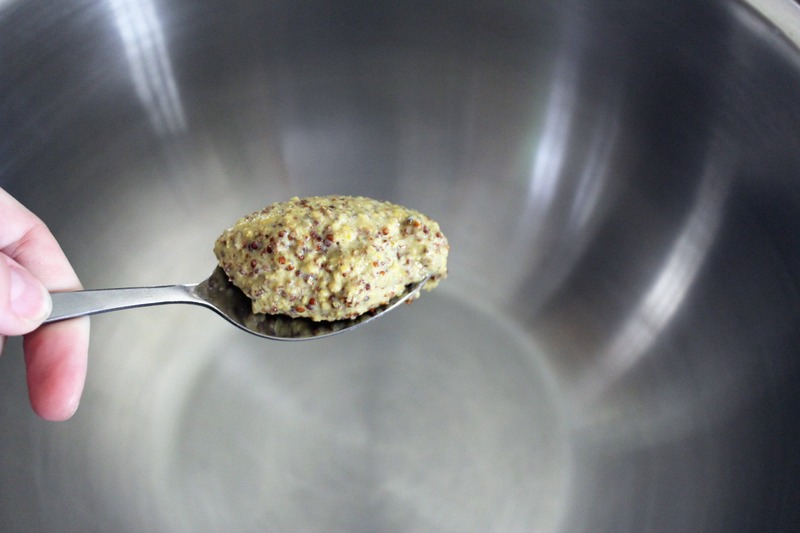 Start with a big spoonful of the mustard in the bottom of a large mixing bowl. 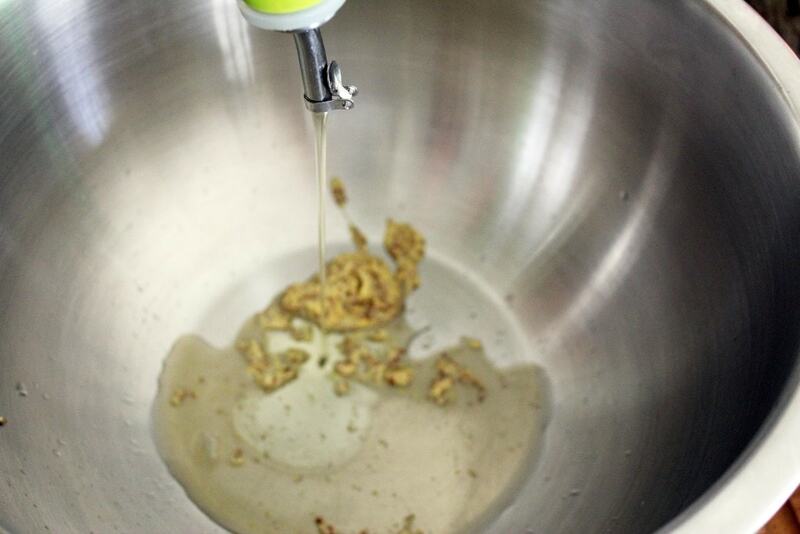 Then, add the vinegar and stream in the olive oil. 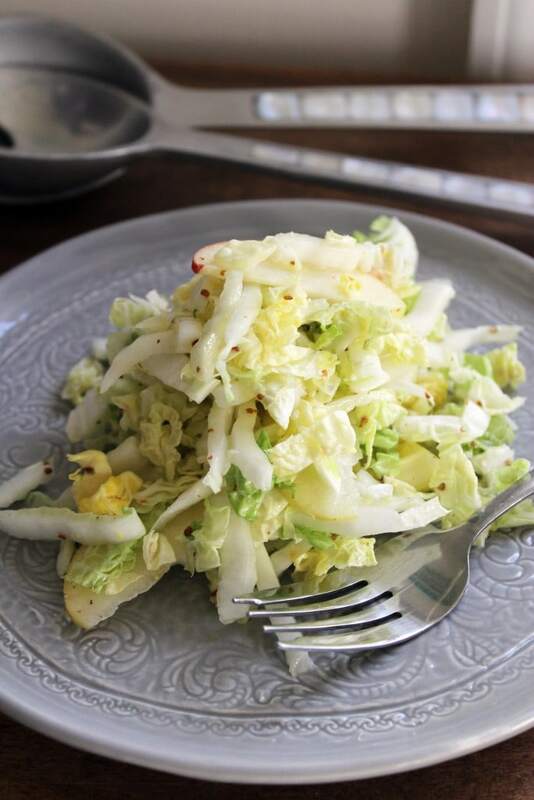 Whisk the whole thing together to make a dressing, then taste it. 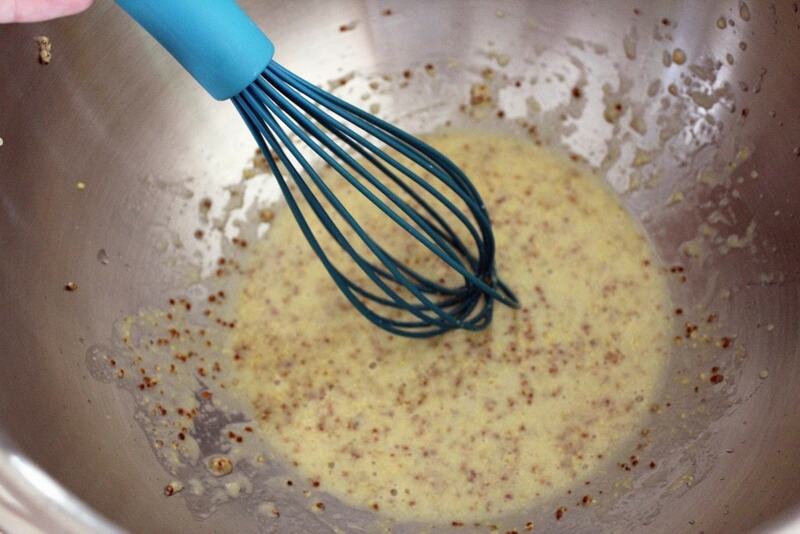 If the dressing seems too tart for your preference, add just a pinch of salt and whisk again. Set the dressing aside while you make the slaw. And core and thinly slice the apple. 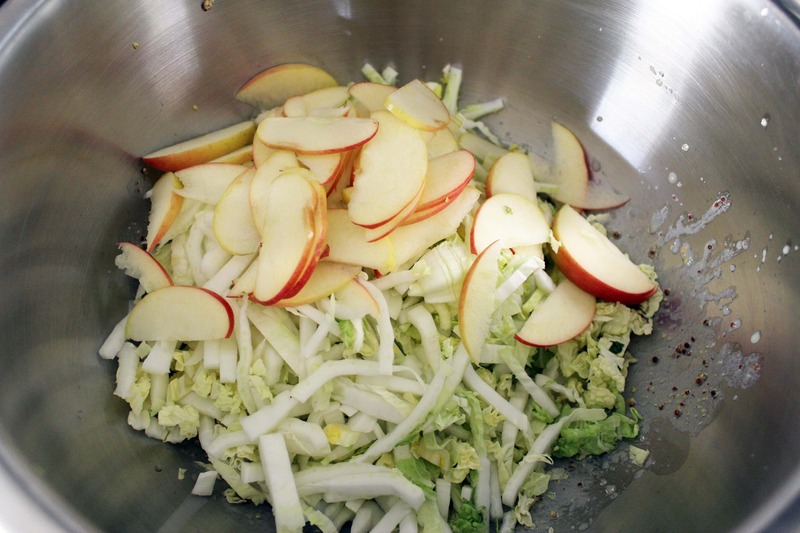 Now, add the cabbage and the apple right over the dressing in the bowl. Use tongs to toss everything together and taste again: if you need salt, add some, if the slaw seems dry add just a bit more olive oil. And that’s it! 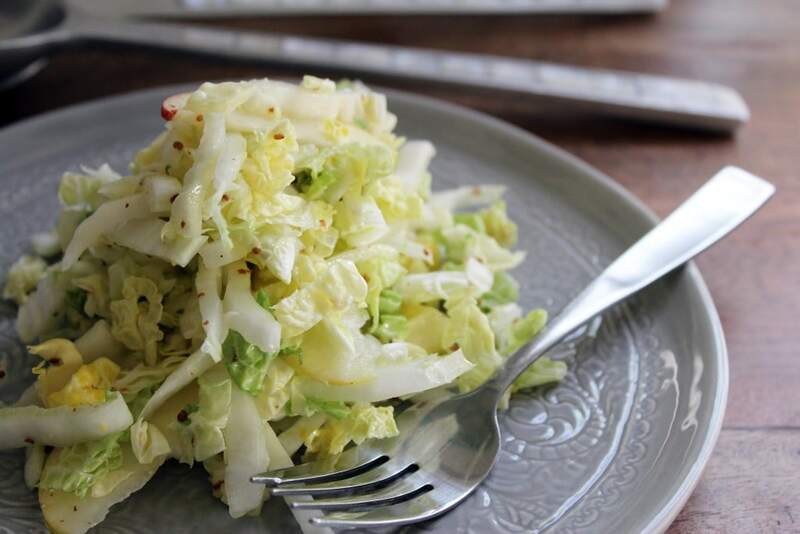 If you use savoy cabbage you don’t need to make this in advance because the cabbage would wilt too much, but to do advance prep just make the dressing and prep the veggies separately, then toss everything together at the last minute. Sweet+tangy+crunchy = epic. Totes American, or whatever other nationality you want this to be. Keep the recipe on hand for the whole summer! Whisk the mustard, vinegar, olive oil, and salt together in the bottom of a large bowl. 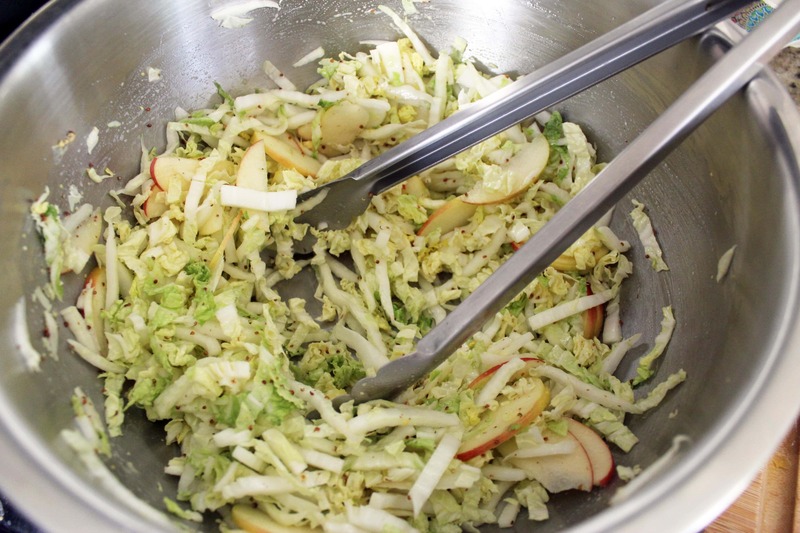 Add the cabbage and apple and toss to combine. Taste the slaw, and season additionally with salt if desired. 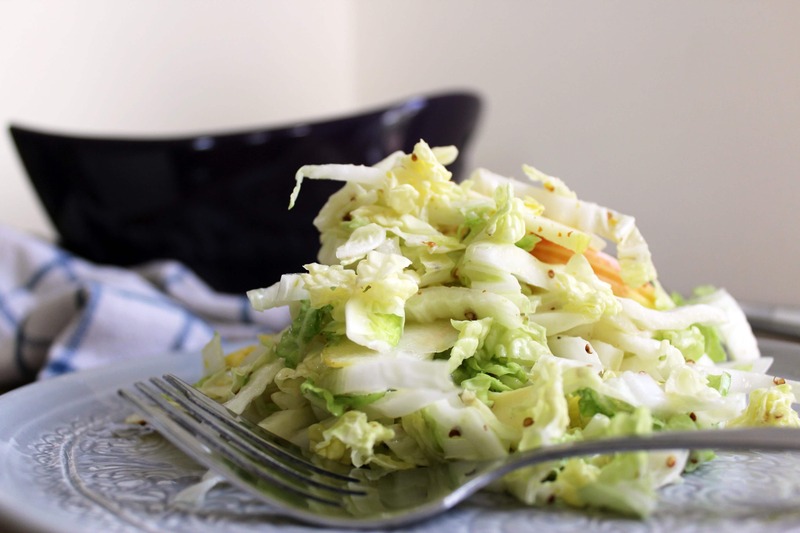 If the slaw seems dry, add a bit more olive oil.